ECCO · 2011, Maggiorella L. et al. 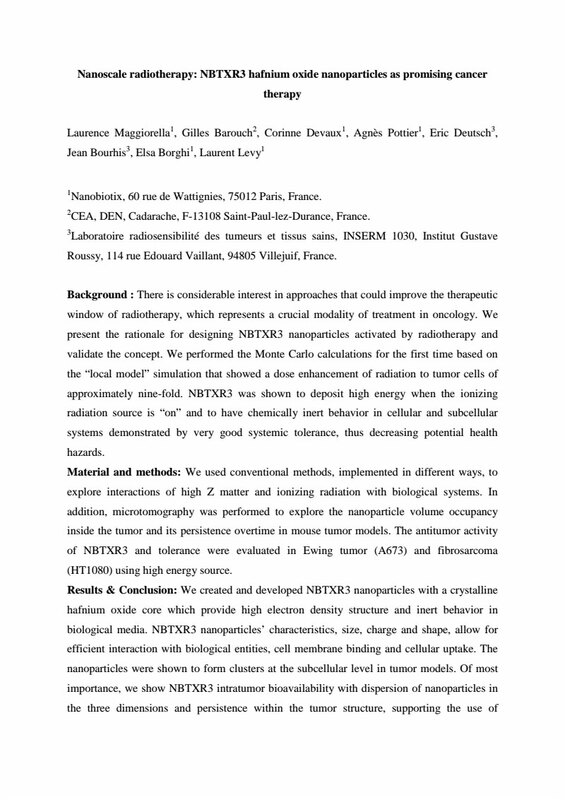 Nano Publications > Congress Abstracts > In Vitro in Vivo NBTXR3 > 2011 – ECCO Abstract – NBTXR3 as promising cancer therapy – Magiorella et al. 2 – CEA, DEN, Cadarache, F-13108 Saint-Paul-lez-Durance, France. 3 – Laboratoire radiosensibilité des tumeurs et tissus sains, INSERM 1030, Institut Gustave Roussy, 114 rue Edouard Vaillant, 94805 Villejuif, France. Results & Conclusion: We created and developed NBTXR3 nanoparticles with a crystalline hafnium oxide core which provide high electron density structure and inert behavior in biological media. NBTXR3 nanoparticles’ characteristics, size, charge and shape, allow for efficient interaction with biological entities, cell membrane binding and cellular uptake. The nanoparticles were shown to form clusters at the subcellular level in tumor models. Of most importance, we show NBTXR3 intratumor bioavailability with dispersion of nanoparticles in the three dimensions and persistence within the tumor structure, supporting the use of NBTXR3 as effective antitumor therapeutic agent. Antitumor activity of NBTXR3 showed marked advantage in terms of survival, tumor specific growth delay and local control in A673 and HT1080 human tumor models. Changing radiotherapy benefit-risk ratio is challenging. These data are supportive for the first clinical development of hafnium oxide nanoparticles, with an on/off mode of action through successive fractions of radiation therapy using current equipment available in hospitals.